4 Color 1 station silk screening press Screen Printing Machine. This manual screen printing press lets you to get the best value from limited project budgets. Designed for small printing shops, whether it is for multi-color or volume printing, this equipment can also serve as an ideal backup solution to larger companies. 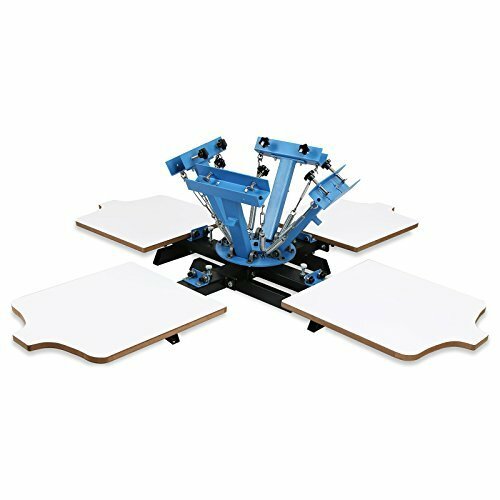 This 4 color 1 station single rotary press can simultaneously install four screen plates. The screen layer is able to rotate independently upon installation, then it is available for four colors' overprinting and making progressive proofs. This screen printing machine is equipped with full set of installation tools, for installation and operation. Loving my new press. Thank You! Great for making band shirts. We have been using this 4 color 1 station screen printing press with no issues. Great price. Click the button below to add the OrangeA Silk Screen Machine 4 Color 1 Station Professional Screen Printing Press to your wish list.